Ashley H. Buono’s passion for the law stemmed from her interests in science and cognitive psychology. She approaches her cases with acute problem solving, analytical and organizational skills. By understanding how people think and process information, Ashley is able to relate to her clients and develop multifaceted approaches to helping them achieve their goals. As a member of Parker McCay’s Construction Department, Ashley represents public and private sector clients. 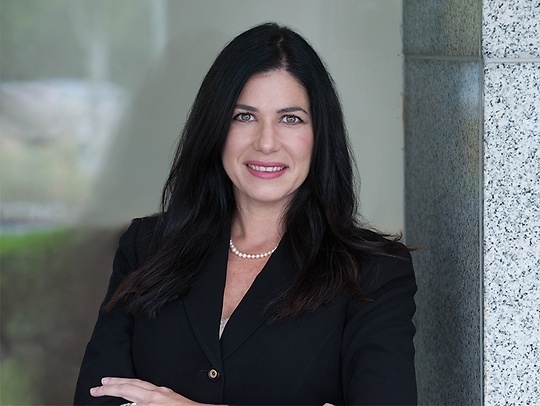 She focuses on reviewing bids and contracts, contract negotiation and litigation derived from construction projects, which includes arbitration, mediation, trial, and appeals. She has appeared in all Courts of New Jersey and Pennsylvania, as well as the Federal Courts. Drawing from her extensive experience in litigation, Ashley is able to counsel her clients in all aspects of construction law. Not only an avid lecturer on the subjects of construction law, she was involved in several notable appellate decisions which changed the legal landscape for the better for her clients. Self-described as a zealous advocate, Ashley’s dedication to her clients has not only gained favorable results in construction law arena, but clients often entrust her to take on personal cases involving other areas of the law. Ashley’s leadership extends past her work at the firm; she founded the Construction Law Subcommittee at the Burlington County Bar Association, where she currently serves as the chairwoman of the committee and is a trustee to the board. Prior to joining Parker McCay, Ashley was Counsel for a southern New Jersey law firm representing subcontractors and mechanical engineers in insurance defense, primarily in product defect and construction-related matters. Ashley was also a Shareholder at a small boutique law firm wherein she represented design professionals in Pennsylvania and New Jersey in construction litigation. Although originally from Bucks County, Pennsylvania, Ashley currently resides in Burlington County, New Jersey with her husband and their two children and is active in the community. Enforcement of the Limitation of Liability Clause In the Professional Service Contract. Burlington County Bar Association, Straight Word (2010). An “A” for an “A”; Judicial Fairness in the Affidavit of Merit. Burlington County Bar Association, Straight Word (2015).